When you’re first thinking about getting implants, you’ll need to consult with your dentist to find out for sure whether this treatment is right for you. During this appointment, you’ll have an opportunity to ask all your questions about implants. Whether you’re curious about cost, potential risks, the timeline for the treatment or anything else, don’t hesitate to talk about everything that’s on your mind. Your dentist will also evaluate your candidacy for implants. If you have adequate bone mass in your jaw and your mouth and body are in fair health, it is likely that you will be able to undergo treatment. If there are some areas of concern — for example, if you smoke or have a health condition that might slow down healing after surgery — your dentist will carefully consider your unique circumstances before making a treatment recommendation. During your placement surgery, your dentist will create small incisions in the gums and carefully insert the implants into your bone. Then, the gums will be closed over the implants. Over the next few months, your body will go through a process known as osseointegration. The implants and the bone around them will fuse together, creating the strongest base possible for your new smile. In some cases, a dentist can place healing abutments (small pieces that protect the implants and encourage gum healing during the osseointegration phase) at the same time they place the implants. In other cases, they’ll close the gums over the implants. Later, the final abutments (which attach the implants to the artificial teeth) get placed later on. This is a minor surgery that causes little discomfort. Once the abutments are ready, the restoration phase begins. This is when your dentist carefully designs your artificial teeth, whether your restoration is a single crown, a bridge, or a denture. When your new smile is ready, your dentist will attach it to your implants, and you can begin enjoying life with your beautiful, strong, new smile. 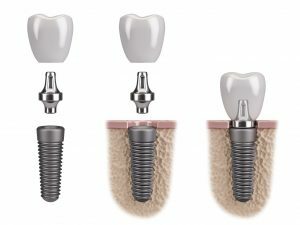 Of course, every implant case is unique, so your journey may be a bit different from what’s discussed in this article. To get a personalized plan for your smile restoration, you’ll need to visit a local implant expert. Dr. Joanne Bancroft has over 15 years of experience in dentistry. She is qualified to perform the entire implant procedure, including both placement and restoration. To discover how she may be able to help you rebuild your lost smile, contact our office at 720-458-6561.